Use the privilege of buying a car of your dreams! We approve all applications within hours. Please fill out our application form to apply. It’s hard to find a good used car. Even if you do run into one that seems like it’s in a decent condition, you can never be sure that will run as it should. You don’t want it to stop after 50,000 or 50 kilometres. That is why we wanted to make owning and driving your car as easy and as enjoyable as possible for you. We are making it easy on to buy a used car in Oakville. Our 13,500-foot dealership in Oakville houses 8 car service bays and a car showroom that holds up to 8 vehicles and a parking lot for about 80 vehicles. Our skilled and highly professional dealers will welcome you and offer you the best value for your money so you leave satisfied with your new used car. Do you need help with car financing? Proud new owner of a 2015 Mustang GT coupe. I walked into the showroom on a Saturday with little intention to buy the car. And by the end of the conversion with Majid I had a deal in place. My first impression of eh shop was A+. Product, showroom and people were top notch. They went above and beyond delivering the car before the following weekend. I have already sent two friends there who are in need of new premium quality automobiles. Thanks to all the staff at CRS automotive for a fantastic buying experience. MyShop helps you keep your vehicle in top shape – and rewards you for it! 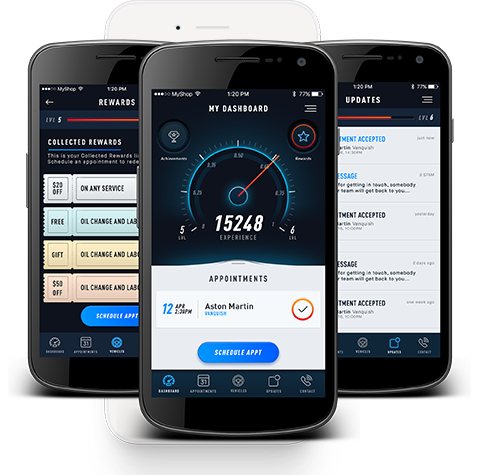 It turns the tedious and confusing world of automotive repair and maintenance into a simple and efficient experience with rewards and achievements. Earn points and rewards with our new app!